Most weekdays, shortly after two PM, I can be heard rumbling "It's impossible, insufferable, intolerable!" while my son laughs or joins in. Ranger is a kid who loves repetition, so one book can dominate our naptime and bedtime selections for weeks on end. 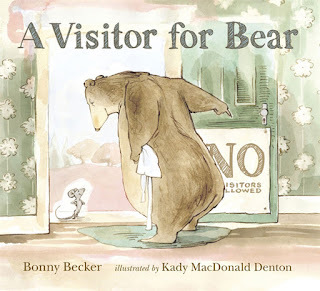 Bonny Becker's A Visitor for Bear contends to be our longest running favorite. I am surprised not to be tired of this book after so many readings, but I actually look forward to reading it aloud. The book concerns a bear who is repeatedly visited by a persistent mouse requesting tea. Bear, a grouchy loner, points to the prominent "No Visitors Allowed" sign on his cottage door and sends the mouse on his way. The little mouse, a spritely rodent Houdini, keeps appearing in the cupboards and cabinets as bear goes about "the business of making his breakfast." Bear progressively barricades his house only to find the chipper interloper in a new location. Finally, the bear breaks down and agrees to serve the mouse "a spot of tea" before "a crackling fire" on the condition the fuzzy fellow will leave afterward. SPOILER: In a twist ending, the bear ends up enjoying the mouse's company immensely and is disappointed at his departure. Bear pleads for the mouse to stay. The mouse reminds Bear of his sign. Bear tears down the sign saying, "That's for salesmen, not for friends!" The mouse brightens, and the pair can be seen sharing more tea by the fire at the book's close. A Visitor for Bear incorporates repetition without being obnoxious. Kady MacDonald Denton's illustrations charm and entertain in harmony with the text. When I read the book I can imagine Bonny Becker's pleasure upon seeing these lovely, fitting representations. This talent author-illustrator team is certainly one to watch. Their next Mouse and Bear book, A Birthday for Bear, is expected in September 2009. I'm going to pre-order it today. Checking the stacks for it right now!